This is an issue I have been discussing for at least 10 years since discovering it was a leading cause of cancer in many areas of North America. Research had been completed in the U.S. several decades ago with regards to electromagnetic radiation around electricity corridors and towers. It turns out that the cause of the higher than normal incidence of cancer were not from EMR, but rather Radon gas which was, coincidentally, naturally occuring in all of the areas of the corridors. Unfortunately, electricity corridors have remained with a stigma eventhough there is no longer the correlation there was once thought. Radon is a colourless, odourless gas that is produced naturally from the radioactive decay of underground uranium minerals and is often drawn up and concentrated inside our homes. Radon gas is the leading cause of lung cancer in non smokers, and the second leading cause in smokers. Because Radon is an odourless and colourless gas, many Albertans are not aware that it is accumulating in their homes. Once the gas enters your lungs, it causes DNA mutations that lead to cancer. 1 in 8 Albertan homes tested over 200 Bq/m3, currently Canada’s maximum acceptable Radon-included cancer risk limit. 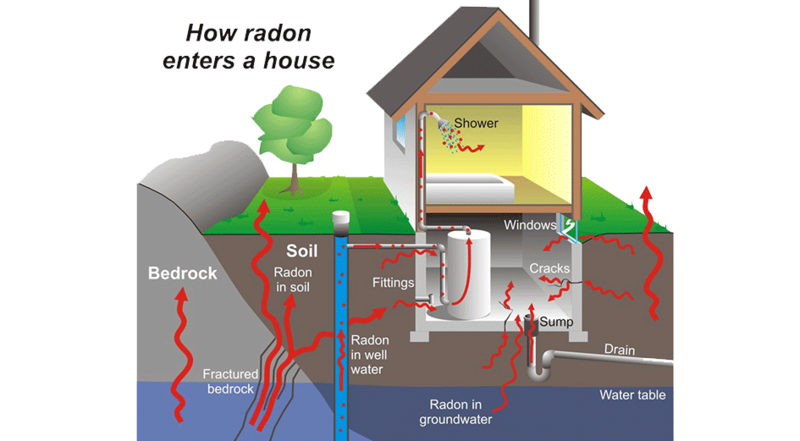 Having your home tested is the only way to determine the risk to you and your loved ones from Radon gas. Testing for the presence of Radon gas takes a minimum of 90 days in a home evironment and is most reliably completed in the winter months. This testing is NOT part of a standard home inspection for the purchase and sale of a home due to the LONG timeline to get the test done (it's a much, much longer process than testing for the presence of asbestos which is a similar issue in older homes). If you are buying a home, then you should have it tested. If you own or live in a home, you should have it tested. Then, you can address the issues if they come up. There are some "quick tests" available that are completed in 24 hours, 48 hours or 7 days. All have a large margin for error and the results can only indicate that a long-term test is required. Even then, with a "satisfactory" reading and a 10% margin for error, is that something that you would conclusively say there was minimal Radon gas present? As a homeowner, you should get your home tested. As a home buyer, this would be one of the many items that you are going to want to accomplish in your first year in your home. The Lung Association, Alberta - Radon. As part of the home purchase and sale process, it is typically a waste of time and effort to include conducting Radon gas testing as a condition to the Offer of Purchase and Sale - the minimum testing period (for reliable results) is far too long. Sure, look for signs that mitigation has happened, and ask if the testing for Radon gas has been completed (if it has, ask for the results). Because this is a Latent Defect, expect sellers to readily disclose that they have had a test done (and that it failed). (Latent Defects are required to be disclosed by the homeowner under Alberta Common Law if it is known to the seller, if it is not observable by a potential buyer or their home inspector, and if the defect renders the home uninhabitable.) Whether or not the issue is "material" to the potential buyer is something that the buyer needs to determine as the cost for remediation is quite inexpensive and certainly cheaper than, say, replacing carpeting which home buyers are usually prepared to do upon purchase of a resale home. Testing for Radon gas is a responsibilty of the homeowner. A potential Buyer relying on a Radon gas test completed by the Seller in a transaction is as unwise as a Buyer relying on a home inspection provided by the Seller. Once the home is purchased, this is one of the many items (in addition to the laundry list of items identified on the home inspection report) that the buyer should be prepared to prioritize and accomplish over time. The 3-month testing for Radon gas typically costs less than about $100 (including the testing device, the sample testing and shipping to the one testing facility in North America). As technology improves and becomes more affordable, expect some home inspection firms to purchase or lease a Radon gas detection device that can provide reliable results within a week. This is similar to what we have seen with thermography of homes. Because these Radon gas detection devices are still cost prohibitive, expect to pay substantially more for a home inspection report completed with results in a week's time. Not only does it require two trips to the home, but the detection device would need to be left in the home being tested for the duration of the test (requiring more than one unit to do more than one inspection/test per week). With the current high cost of home inspections already a concern to a homebuyer, I'm quite certain we likely won't see too many inspectors adding this device to their "bag of tools" anytime soon. We should, however, expect home inspectors to begin selling or providing (at cost) a 3-month Radon gas testing device as part of their services once a homebuyer has taken possession of their new or resale home.